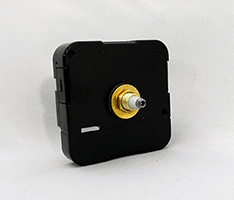 Upgrade to silent clock motors with these quality clock motors that run in a sweeping motion, and thus eliminate the stepping sound made by a traditional quartz movement with step second hand. 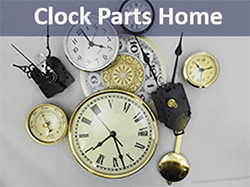 Virtually silent clock mechanisms bring a new dimension to clock making projects. 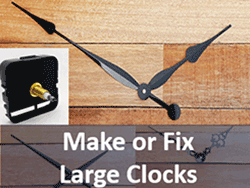 Enjoy years of trouble free operation with these quality clock mechanisms. Summary: The clock shown above the bed uses a high torque continuous sweep motor, and is mounted to the wall with one of our mounting cups. 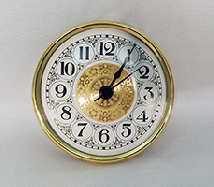 You also see our vinyl numbers, and 14" clock hands for a 32" diameter clock. 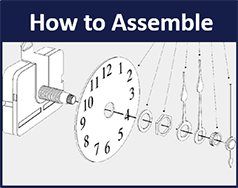 Clock Parts Shopping Tips - Motors and Hands Must be Added Separately. 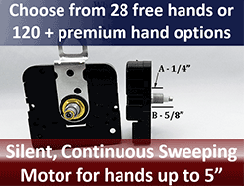 High Torque Clock Motors are more powerful - made specifically to handle the extra weight of longer clock hands up to 18" in length. 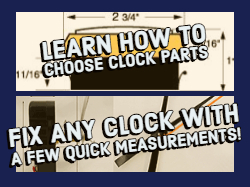 This means you can make a clock with a clock face/dial that is 42" wide or even greater! 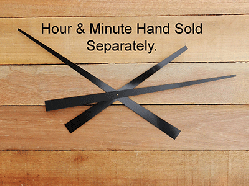 Comparatively, standard movements run clock hands up to 4.5 inches long. 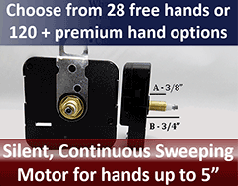 What are the different types of continuous sweep movements? 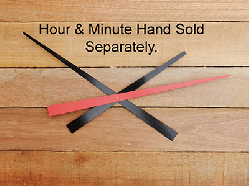 2) High Torque Continuous Sweep Clock Movements drive the longer hands and can drive a second hand (see below in red or black, 10 inches long). AA and C Cell batteries. The C Cell will simply last longer. 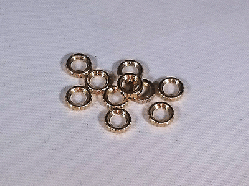 3) Clock Insert - One style at the moment. 3) Our clock motors are sized by the thickness of the dial the movements can go through. 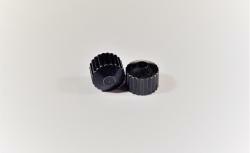 EG Q-17-CS below will go through up to 1/4" thick material. 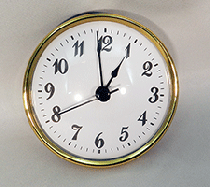 If your material is too thick, consider removing some to in-set the clock. Or if your clock face material is too thin, consider adding some material behind the face so the hands will sit closer to your clock face. 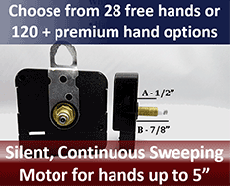 For mini movements we have over 100 types of hands, with 28 options that are free. 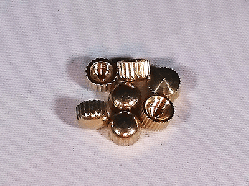 Read product details to see if the set includes a second hand. If not, you can choose a second hand separately. 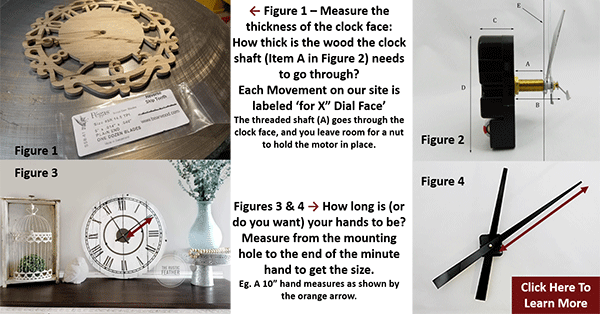 Join us on Facebook - We are part of an awesome Facebook Group called "Making and Fixing Clocks!" Click here to request to join. 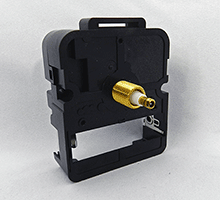 Two Piece Mounting Cup to attach clock motors to walls directly! 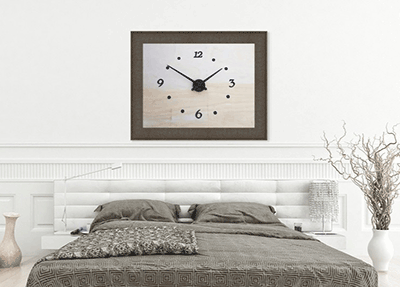 2 Piece Mounting Cup for C Cell High Torque Motors - Make Wall Clocks easily!